Six people have been admitted to the Navy Hospital in Bulgaria’s Varna after swarms of bees attacked villagers in Lyuben Karavelovo and other villages near the Black Sea capital. The 6 are being treated in the Clinic of Toxicology at the Hospital doctors reported. 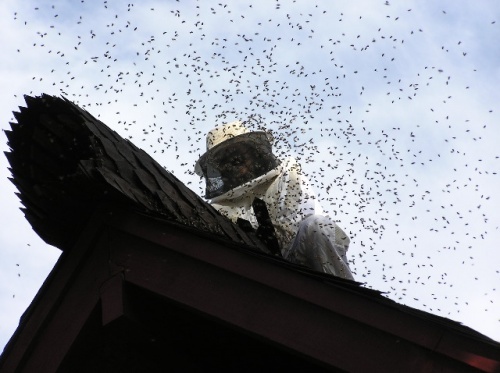 The incident allegedly occurred when a bee-keeper was looking after his hives. The bees formed a swarm and stung the man severely before attacking and killing his dog and one of his horses. The bee-keeper’s sister was also attacked alongside 2 neighbors who tried to help. In a separate incident 1 farmer in the village of Dolen Chiflik was attacked and in Varna itself a man was attacked in his villa – he was allergic to bee stings and was rushed to Hospital. Experts in the area said the strange behaviour was unusual and told people to seek immediate help if stung repeatedly by bees.